Ultraflo is the latest hemihydrate liquid floor screed product on the market. Hemihydrate floor screeds have been created in Germany and been used throughout Europe for over 25 years. Due to its hemihydrate formulation, Ultraflo® self-levelling liquid floor screed has the benefit that it does not suffer from surface laitance (a scum/dust of material adhering to the top of the screed during the curing process) unlike other liquid floor screeds on the market that are not formulated in the same way. This unique advantage means ultraflo® hemihydrate liquid floor screed requires no buffing/grinding to the floor surface prior to application of floor finishes. We are approved Ultraflo® contractors that will professionally install the liquid floor screed on site in a cost effective, timely manner. 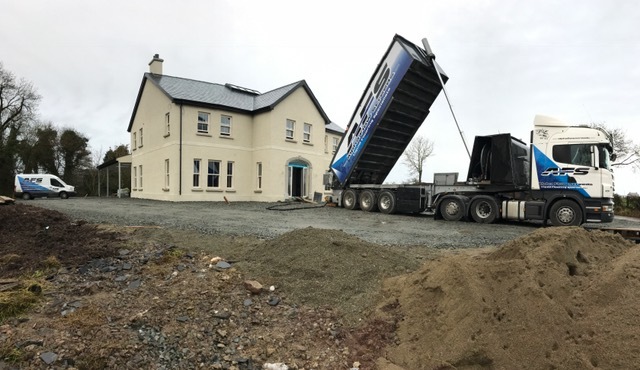 We are a market leading company manufacturing, suppling and installing liquid floor screed throughout Northern Ireland and Ireland. What are the benefits of using Ultraflo® Liquid Floor Screed? Ultraflo® is not subject to surface laitance (a scum/dust of material adhering to the top of the screed during the curing process.) This unique benefit means ultraflo hemihydrate requires no buffing/grinding to the floor surface prior to application of floor finishes unlike other liquid floor screeds. Fast heat response times resulting in greater thermal efficiency when used with under floor heating. Speed of installation, up to 2000m2 per day, and is virtually self-levelling. Reduced laying depths, weights and drying times (as little as 50mm required). Allows light traffic in 24 hours. Economical alternative to traditional sand:cement screed. Eco-friendly credentials, being formulated from a by-product of flue gas desulphurisation. 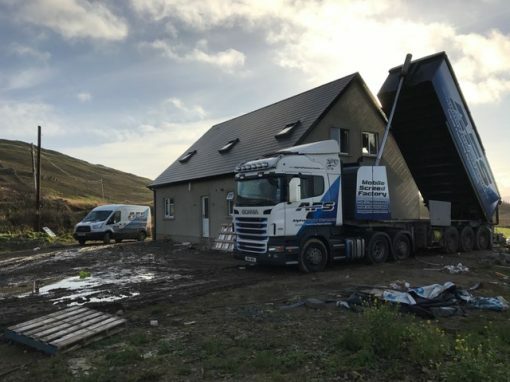 There is a certain amount of preparation to be undertaken for our team to come out and install your flooring using our unique liquid floor screed from our mobile screed factory. 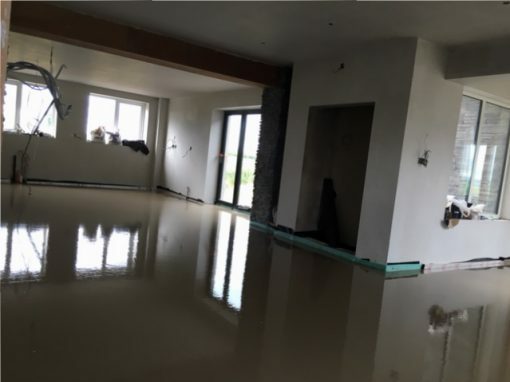 How can I prepare for Liquid Floor Screed being installed? It’s important that your building is air-tight with your roof, all doors and window already in place. If there are any openings in your home or business premises, you can still cover these with polythene to make sure the site is weatherproof. You should also scrape off any debris on your floor and a brush of the floor to tidy it up so it’s ready for our installation. it is laid flat and in solid contact with the subfloor throughout. If necessary use a weak sand:cement mix to help level the insulation. Fill any voids around the pipes, with a weak sand:cement mix and level off. Then place the 2nd layer of insulation over the 1st layer, ensuring it remains flat, with no rocking. Install the edging strip around all walls, taking care to ensure it is neatly placed into all corners at 90°. Tack the edging strip to the walls using a staple gun as required to hold it in place. Place 500 gauge plastic over the top of the insulation ensuring it is pulled tight with no creases. Lap joints a minimum of 100mm and tape joints. Tape the 500 gauge membrane to the plastic skirt of the edging strip. Brush or hoover up any debris that might be sitting on the plastic cover so it’s all clear for liquid floor screed installation. Install the underfloor heating pipes, ensuring they are fixed down every 400mm along the length of the pipes and more frequently on bends. Fill the underfloor heating pipes with water. Install expansion joints across doorways, where thin corridors open out to larger spaces and where the aspect ratio exceeds 1:6 (for further advice contact Technical). Cut away notches on the underside of the joint to allow it to sit level over the UFH pipes. Brush or vacuum out all debris from the surface of the plastic. Any material left will float once the screed is poured and this will result in blemishes on the surface once the screed has hardened. Inspect the whole tanking system for any tears or untapped joints, make good ready for screed to be poured. Only approved contractors can lay The contractor will arrive on site, set up the pump, check levels and agree a datum level with you. 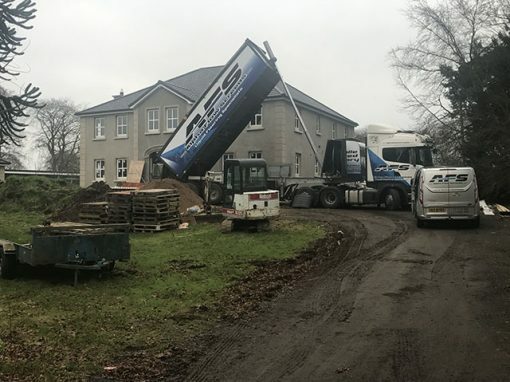 Once our Mobile Screed Factory arrives with the screed, the layers will commence pumping the liquid screed. Six cubic metres of ultraflo can be pumped in approx 30 minutes. The screed is then dappled in two directions to level the surface and then left to dry. How do I protect the liquid floor screed while it sets? After our team have completed installing the Ultraflo Liquid Floor Screed, keep all doors and windows closed for at least 24 hours to protect from any impact of weather like frost, sunlight, wind or rain. You can refer to the Ultraflo® Aftercare Guide for information on drying, priming and floor coverings etc. Ultraflo is a calcium sulphate, hemihydrate pump applied liquid floor screed. It is formulated as a by-product of flue gas from desulphurisation and is eco-friendly. It is designed to comply with BS EN 13813:2002, screed material and floor screeds, screed material – properties and requirements. How can Liquid Floor Screed be used? Ultraflo liquid floor screed can be used for subfloor levelling. Due to its liquid nature, it is a self-levelling floor screed which makes it faster in subfloor levelling as well as making it ideal for application with underfloor heating systems. It can be applied on unbonded, bonded and floating floor constructions. Liquid floor screed is suitable for application on floors for both residential and commercial premises. What makes Liquid Floor Screed unique? Ultraflo liquid floor screed is solid and strong, providing excellent resistance to any impact and exceeds requirements for Category A Floors. It has virtually zero drying impact and you only need to consider movement joints when the floor gets to over 1000m2 in size, though these joints should also be considered across doorways to other rooms. The liquid flow of Ultraflo means it is self-compacting so this means gaps and poor compaction are virtually eliminated. What are the technical properties of Ultraflo Liquid Floor Screed? How much Liquid Floor Screed should be applied to my floor? It is worth noting that any deviations in the levels or the subfloor surface should be taken into consideration when we determine the depth of the screed to ensure the minimum can be achieved. Immediately after application you should keep all windows and doors closed to protect the surface of your new floor from frost, direct sunlight, wind, rain and water ingress. In extreme cold weather, please ensure the air temperature above the freshly poured ultraflo® is kept above 2°C. After 24 hours, it is essential to open the windows and doors during the day to allow a flow of air through the building to aid the drying process. (Failure to do this will prevent the floor from drying effectively). 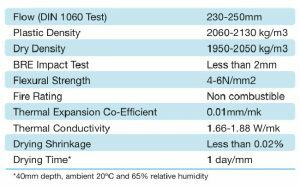 Under standardised drying conditions, as per the British Standard (temperature of 20°C and 65% relative humidity) ultraflo® will dry at a rate of 1mm per day for the first 40mm of depth and 1/2mm per day thereafter. Storage of materials on the screed surface, accidental spillages of water, humid or cold environments will all delay drying. Ultraflo® can be force dried after 7 days from installation by turning on the under floor heating circuits to a temperature of 20°C, and gradually increasing it by 5°C increments per day, until it reaches its normal working temperature. (Max water temp 55oC) It is essential that all windows are opened to generate enough ventilation for moisture released from the screed to escape, keeping the interior of the building free from a build up of condensation. What floor finishes can I apply to the liquid floor screed when dried? As with most screeds, Ultraflo is not a wearing surface and requires a suitable floor covering. It can be used with any standard floor coverings available including tiles, wood, lino or carpet.